I have tasted many a times form different Pani Puri Walas in Bhubaneswar. But specifically I remember of one who sold in the market complex near our residence. His name was Basu. He was a fair lean and tall young man around 23 years. I was his regular customer and regular customers are always given special treatments by him. And special treatments included extra two puri with masala toppings and free bowls of tart water till one is content to heart....eer... Stomach. He had a special kind of charm in his face to attract customers and above all he was the neatest Pani Puri Wala in the locality. One can never question the kind hygiene he maintained in his portable four wheeled Pani Puri stall. Due to all above good qualities, Basu had a hold in the business in the vicinity whereas fellow vendors suffered like anything. Unknowingly he cultivated enemies. It was in 2007 I left Bhubaneswar for higher studies, I lost contact with lesser known acquaintances. Basu was among them. I used to remember of him during my visits to home in semester breaks or festival holidays. During my 1st and 2nd visits after I left Bhubaneswar he was doing well in his business. He even asked about my sudden disappearance. He said he was sad to lose a regular customer. I smiled and wished him luck, and told in jest that may his beautiful female customers increases by ten times. He laughed and said," hope your 'thus spoke' becomes true". After that I completely forgot Basu. Thoughts of Career, Job & future made me forget everything what were once things of beauty and joy for me. In June 2012 I again remembered about Basu. Then, I was in Bhubaneswar and was on a leave to meet my would be wife as arranged by my parents as prospect for my marriage to her, which later happened in December of the same year. It was the day after I made the visit, I was very happy. I thought to celebrate with my younger cousins and the treat was to begin with Pani Puri. I remembered of Basu again, I was skeptical whether he would be there or not. He was not there, some other person were selling Pani Puri at his Place. And on one side of stall it was written "Basu Bhaina spesal Pani Puri" and the Pani Puri he served was nowhere equal to the taste Basu used to prepare. I enquired about Basu to the Pani Puri Wala. He said he died two years back and he was his brother in law who is taking care of the stall. I was almost in a shocked state. The cheerful face of Basu flashed before my eyes. With deep condolence in heart I asked his brother in law," What happened to him?" He said, Basu was very badly beaten down by a group of drunkard people while he was returning to his house after daily business. He was newly married and was very happy with his life. He is survived by his old mother, his wife and a year old daughter. I asked who were those drunkards. He said, "Who else..., those who didn't liked his growing business." "Yes, they were, only for a day or two. His case is closed and I have to take care of his family." I asked no more as he indicated me to leave as customers stood around his stall with the plastic plates waiting for their turn to be poured with Pani Puri. Very touching bhaiyya. This is our current state anybody can be killed for such foolish reasons. Mmmmm yummy Pani puries....the very name sets my stomach on a hunger pang. 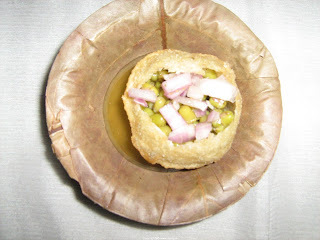 I had a wonderful encounter with a pani puri bhaina too. I was horribly hungry while running from pillar to post for my PhD work in Vani Vihar. Then I rode all the way to RD front to have Pani puris. That pani puri bhaina went on serving me and I went on hogging the pani puris till my heart's content. When it was time to give money I realized that I was short of ten rupees! I asked him for forgiveness and told him all the truth.He was soooo sweet. He said, "no problem sister, its ok". He gave me two puris more. The next time I visited him and offered the 10 rupees, he never took it. I learned a great lesson that day......"Even if a rich person is loaded with jewels and money he thinks twice before giving it to a poor man. But, even if a poor man struggles for his daily living , he never steps back in sharing his bread:) "....Thank you for taking me down the memory lane through this lovely story Gyan. With good intentions and noble thoughts this world can be made a better and safe place to live in.